Since those features are identical, the review scores are identical. Jewel Quest Expeditions is very easy to navigate. "Wireless" is right on the main menu and guests can then begin connecting. The opening credits sequence is mostly skipable and the download time is respectably appropriate. The quickest increasing demographic among gamers world-wide is the "Casual Gamer" demographic. Casual gamers are people that play games for fun (not competition), enjoy playing their games when they only have a few minutes (they may - or may not - enjoy long, in-depth gaming experiences), and prefer games that can be played through more than once with an equally-enjoyable experience each time. 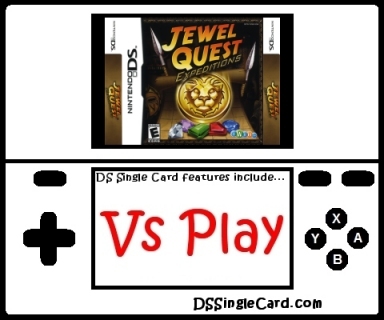 Jewel Quest Expeditions is portable (Nintendo DS), can be played in only a few minutes, and doesn't require anyone to remember intricate plot lines or character names. It's a fun puzzle game (from a well-respected series) that can be played over and over again and the experience is virtually the same each time (no loss of enjoyment due to already knowing the plot secrets). I enjoyed Jewel Quest Expeditions. I found no programming flaws or glitches. I found no real problems of any kind. Sure, I would have enjoyed a lot more variety in the different multiplayer playing modes, selectable time limits and jewel sets, and the inclusion of a demo. What I got, though, was still a very enjoyable puzzle game. A lot of the gaming web sites are treating Jewel Quest Expeditions like yet another throw-away, budget bin title, but I believe that Jewel Quest Expeditions stands up on its own as a fun game that fans of the series will find quite enjoyable. If puzzle games ain't your "thang" when playing on a Nintendo DS, well... why are you even reading this review? If you enjoy puzzle games but have never played a Jewel Quest title, Expeditions is a great place to start. I can tell you that I will definitely be playing this one again.